As I’m still living the high after having witnessed the “mother of all Maker Party’s”, The Mozilla Festival (MozFest), I thought it was due time to look back at the last four months and do a little deconstructing on what went on. At a quick glance, the success was clear. We doubled the number of events around the world that encouraged teaching and learning the web, we reached thousands of individuals who in some capacity increased their digital skill set, and we proved that Webmaker was a valuable tool to make something awesome, teach others and build online confidence. We were taking the people who were experiencing the web-olution and turning them from consumers to producers, albeit slowly. We worked off the premise that all it took was that introduction to editing your first image online, creating your first web page, or making your first meme to help you realize that you’re more in control of your participation in the world wide web. From there, we left it up to the individual to determine how deeply they would dive into the web. Some thought the tools were cool but we didn’t see them resurface after their first make, while others saw the possibilities and dove head first into the world of endless web development and content creation. In both cases we were successfully producing (web)makers. Rahman visited an orphanage where he went to teach the children computer skills and upon pulling out his computer learned the children had never even seen a computer before. He vowed to go back and yes, he has visited again. You can read his story here. 8-month pregnant Cassie led a BabyMaker Party in Toronto where participants made their baby’s first website or their first baby website. Or even just a website for someone they love. They used Thimble to “remix” a baby website, along the way learning some basics of coding with HTML and CSS. I first learned that my friend Bonnie was pregnant after seeing this webpage she made at the event. The Mozilla Nigeria Community took part in the fun by planning a Maker Party in Bonny Island, Nigeria. The theme of the event was “Creating web solutions to real life problems” through Thimble. One of the young attendees made this page on how to avoid road accidents. Among the instructions is don’t drink and drive or use your mobile phone while driving. In a few months we learned that we could use making and events as an affective way of teaching among different demographics. Individuals used the kits we produced to teach the web or remixed or created their own new kits to customize how they wanted to teach their community. We learned that Kitchen Parties, where you have a small number of people hang out in the kitchen and do a couple small X-Ray Goggles or Thimble tasks, were widely popular because of the low cost to organize and plan but sense of success and fulfillment that followed. Hell, I even threw a Kitchen Party with my mom. Events came in all sizes and the Webmaker tools proved easy to adapt for both small and large audiences. We recently ran a feedback survey to understand the community and what the motives were behind throwing events, how effectively we were supporting them, where we could improve and general thoughts for the 2014 campaign. My purpose for the study was to understand, learn and grow because that is the only way myself and Maker Party can continue to be better over the years. Here are some of my favourite answers to the first two questions of the survey that were asked in order to understand the value of Maker Party for the people who threw them. When asked why they threw a party? When asked how they felt after throwing a party? 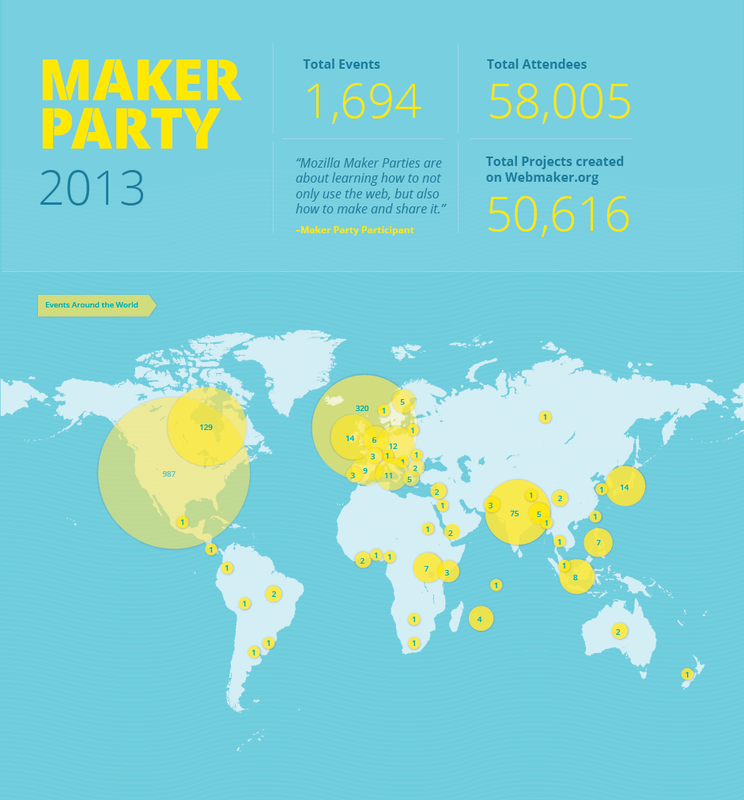 The Maker Party global spread is magnificent but I would be lying if I said we were equally represented in all places of the world. I want to work with the under-represented areas of the map to establish the communities who might not have as strong of a presence, while also working with the existing communities to further their development. Improve the accessibility of the types of resources people can leverage for their event. Creating some sort of system where we can organize kits based on small/big groups, young/older ages, beginner/experienced levels, online/offline activities, etc. We have kits for every need but let’s make it easier for people to find ones that are most useful to their needs. We learn a lot about individual needs and the tools that help to teach the web at events. I would like to foster a more improved way in which we can be constantly growing from this never-ending pool of feedback and make even better tools that respond to these growing needs. Our mentors are inspiring individuals at every event they host. I want the attendees that come to their first workshop or learn a new skill to go forward and feel empowered enough to teach someone else their new skill. Sure this happens but my questions focus on how do we continue to encourage this, provide the right resources and track. Along the lines of above, how do current mentors train a new wave of mentors. Community members have increasingly expressed interest in a scalable version of a Train the Trainers program where they can provide the support and knowledge to those in their area that want to volunteer or run their own workshops but might lack the know how. 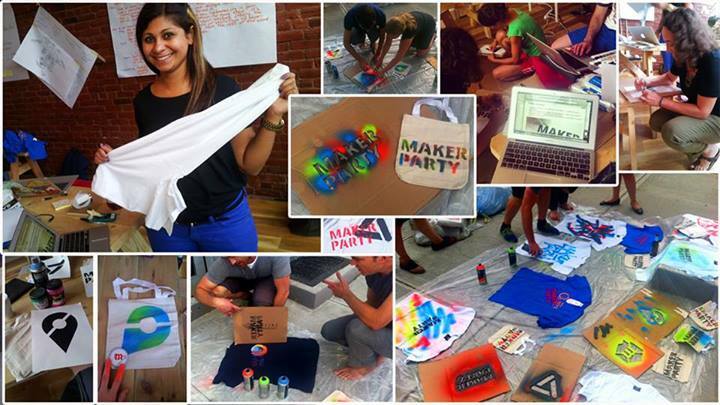 Taking what motivates people to teach or learn the web and make sure that it is provided in the Maker Party package. We’ve collected a lot of this data in the last few months and I want to work on leveraging it for the future. Read straight from the Webmaker team how Maker Party helped them research and develop their products, as well as learn the audience. 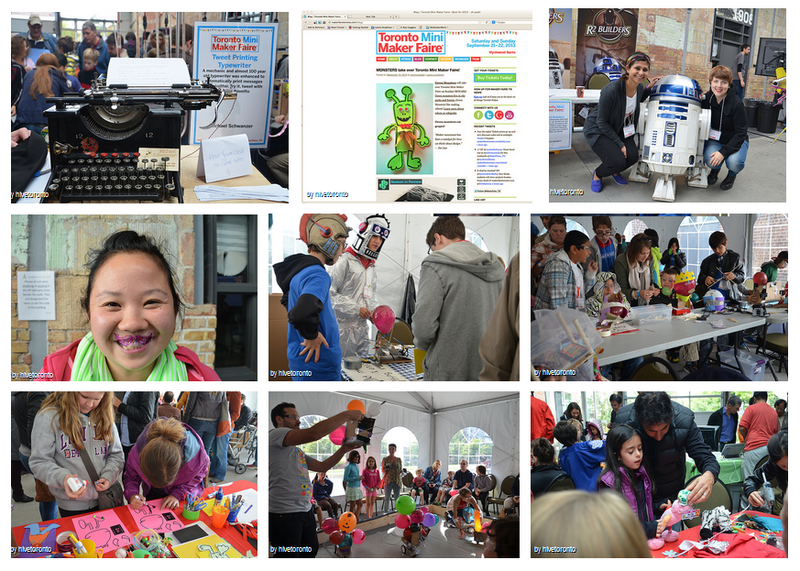 Read the Maker Party 2013 recap straight from the Mozilla blog. Or read Mark Surman’s blog focusing on the foundation for Maker Party and the hypothesis we first set out with. He also did this post on some of the Maker Party’s he visited and my personal favourite, a post on our community members who threw Maker Party’s. generally wasted simply just trying to figure out how to begin.